MANILA, Philippines - Most of the establishments and malls will be CLOSED on Maundy Thursday (April 13) and Good Friday (April 14) for the observance of Holy Week 2017. Check out on this page for the adjusted operating hours schedule of SM Supermalls, Robinsons Malls, Cash and Carry Mall, Ever Gotesco Mall, Araneta Center, Ayala Malls, Century City Mall, Eastwood, Fisher Mall, Newport Mall, Lucky Chinatown, Uptown Mall, Twin Lakes Batangas and Venice Grand Canal. Closed: Araneta, Avenida, Festival Mall, Green Residences, Jackman, Kanlaon, Marikina, Nepa, CityWalk, Megacenter, Bajada, Calumpang, Echague, Ilagan, Ilagan 3, Taft, Laoag 2, San Nicolas, Santiago 2, Solano, Tumauini 2, Banlic, Los Banos, Garden Villas, Silverscreen, Pasong Tamo, Pedro Gil, San Andres, Savers Square, Zapote, Bagabaguid, General Trias, Canduman, Consolacion, Maguikay, Naga, Cebu, Parola, Jaen, San Carlos, Angono 2, Del Monte, Muntinlupa, Nova Plaza, Onemall, Concepcion, Tagum, Sta. Maria Bulacan, Citymall Imus. April 13 (Maundy Thursday): All malls CLOSED except Robinsons Luisita, Robinsons Place Pangasinan (10 a.m. to 8 p.m.), Robinsons Place Malolos, Robinsons Place Antipolo, Robinsons Starmills, Robinsons Place Palawan, Robinsons Place GenTrias (10 a.m. to 9 p.m.), and Summit Ridge Tagaytay (regular mall hours). April 13 (Maundy Thursday): 10:00 a.m. to 8:30 p.m.
April 15 (Black Saturday): 10:00 a.m. to 8:30 p.m.
April 16 (Easter Sunday): 10:00 a.m. to 8:30 p.m.
April 13 (Maundy Thursday): 9:30 a.m. to 8:00 p.m.
April 16 (Easter Sunday): 9:30 a.m. to 8:00 p.m.
TriNoma, Glorietta, Greenbelt, Fairview Terraces, Marquee Mall (Pampanga), Market! Market!, Alabang Town Center, Abreeza Mall, Centrio Mall (Cagayan de Oro), Ayala Malls South Park, Ayala Malls The 30th, Circuit Lane, District Northpoint, District Imus, District Dasmariñas – Closed on Maundy Thursday and Good Friday. OPEN: Maundy Thursday and Good Friday: Ayala Malls Solenad (11 a.m. to 9 p.m.), Harbor Point (10 a.m. to 9 p.m.), UP Town Center (10 a.m. to 10 p.m. on Thursday only), and Ayala Malls Serin (10 a.m. to 10 p.m.). 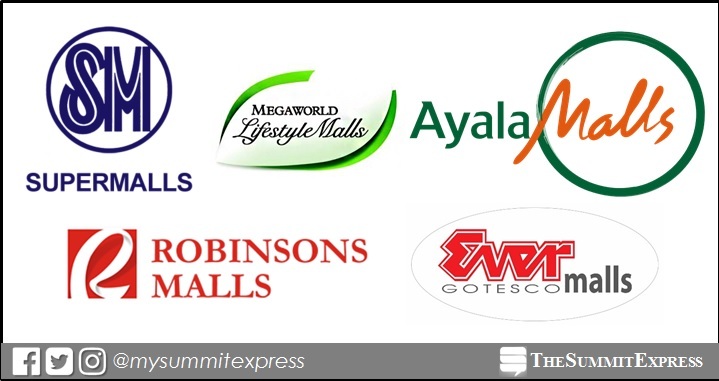 Selected stores will be open at Ayala Malls Legaspi and Bonifacion High Street. ALL AYALA Malls: Regular mall hours on Black Saturday, and Easter Sunday. Black Saturday: 10 a.m. to 10 p.m.
Black Saturday: 12 p.m. to 12 a.m.
Black Saturday: 11 a.m. to 11 p.m.
Maundy Thursday: 10 a.m. to 9 p.m.
Good Friday and Black Saturday: 10 a.m. to 10 p.m.
Maundy Thursday: 12 p.m. to 12 a.m.
Black Saturday: 10 a.m. to 12 a.m.
Black Saturday: 10 a.m. to 11 p.m.
Black Saturday: 12 p.m. to 10 p.m.